Live in: Santa Fe, New Mexico. married for 30 years, one daughter from former mistake. Hobbies: motorcyclist for 45 years, anything else with a motor has captured my attention at one time or another, food, wine and spirits, outside living, smelling the roses, classical music, art and architecture, traveling. Favorite quote: "knowledge is the enemy of faith"
Well you don't seem Autistic to me. Maybe it could be ENTism. Still love old FIATs, Studebakers, Willy's and cars or trucks in general. We live for Jesus Christ and enjoy riding as we're able to and as time permits. I'm a deacon at our church and Shannon is also heavily involved in the Ministry of Helps. Our church, www.fwo.org is far from religious or ordinary in that we preach and teach bible doctrine, not church doctrine. Religion is a shackel, Jesus is our strength. We are far from perfect unless you consider us as perfect sinners. But we strive to be worthy of Him. Mario Anthony Malone, nickname Molto, 51yo. Happily married to my high school sweetheart 25yrs., a son and daughter, 2 cats. Last 10yrs Police Officer, previous 20 as a Mech. Eng. for the Defense industry. Traced roots to ancient Rome but now married to a Viking/Barberian, go figure. Fishing, hunting, soccer, family vacations, former foosball Eastcoast Champion, eating. As a kid in Italy I owned a Torino moped 50cc and a 125cc Gilera, returned to riding this past year after 37yrs and it as taken most of my free time and money, I am in love with my 02EV, I must see and touched it everyday. Looking forward to a red Norge with spoke wheels, alternates Vintage or HD Softail Deluxe. Oh yeah my wife is a professional shopper and I am her only client. ok, since pets are being mentioned . . .
mine : congo african grey parrot "pogo" says "see ya later" when i leave the house and lots of other stuff depending on the situation. 911 dispatcher. I tell cops, firefighters and paramedics where to go. Been doing that for 12 years, only job I liked better was flying a King Air. Divorced once, I have 4 kids aged 17 - 22. We have 7 motorcycles, 2 planes, 2 tractors, several 4 wheeled vehicles and I am having trouble keeping up with maintenance schedules. For those of you, like Yaledriver, that like antique aircraft, my friend Tom is doing a ground up restoration of a Fairchild F24 that belonged to the DuPont family back when it was new. I remember seeing your bike advertised for auction at that time (1986), or maybe afterwards for sale elsewhere. The GM story rings a bell as does the bike. Bevel drive engines were not discontinued in 1983, but the 900SS was discontinued, and replaced by an updated model called the 900S2. Many people think the S2 is less of a bike than the SS it replaced for various reasons (it got very poor reviews at the time) so that is why it is significant to some. Today some of the changes are easily backdated. The S2 wasn't sold in the US, which leads to some confusion here, although it was sold in Canada. The S2 used a new frame relative to the 750 or 900SS, recognizable by different engine mounting lugs (flat like a Darmah, versus being a weldment made from two pices of tubing). This frame is well known as a backwards step relative to the SS frame, it screwed up the handing a bit. The same frame was used for post-82 Hailwoods, which were sold in the US. Electriic start was available on the S2. In 84 they introduced different engine cases, with new verison electric start and spin on oil filter for the S2 and Hailwood, but kept rolling element bearings for the rods. Then in 1985, they introduced an again-revised engine on the S2 and the Hailwood, this time the "Mille" with 973 cc displacement and plain bearing bottom end. Massimo Bordi was the technical lead for the engine updates in 84 and 85, he later was the technical lead for all the 4V/cylinder engines that got Ducati their WSB victories. He left when TPG took over from Cagiva. 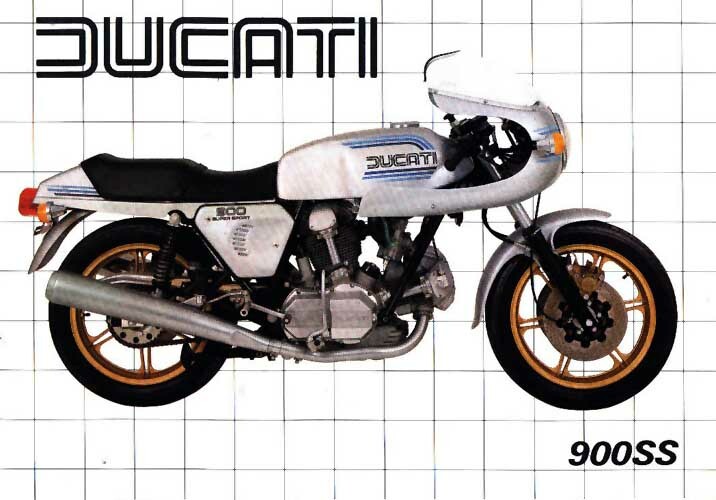 Here is a 1983/84 Ducati 900S2... (this one is actually an 83, but they are very similar except for the engine cases). The fairing is the same as a 600 Pantah. This one has electric start, same setup as a Darmah, never available on a 900SS. Instruments and warning lights the same as the Hailwood or Darmah, with ND gauges, different than the Veglias used on the last SS's. 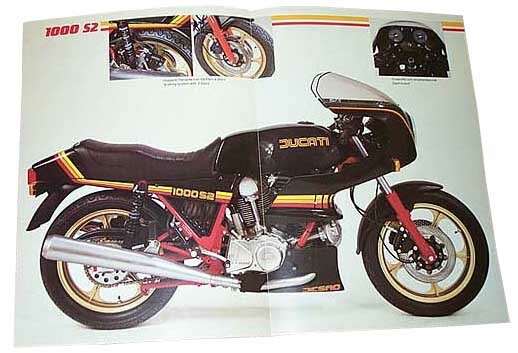 Here is a 1985 Ducati S2 Mille. Note the different engine cases. Sorry for yet another thread diversion! I'd seen that page before, Fairchild 24s are neat airplanes. A friend of mine has a beautiful one with a 200 HP Ranger, unlike this one with its Warner radial. They are cool because they are a little smaller and more economical than the typical 30's cabin airplane. Close to end of ten year contract restoring old farm and buildings in Greece and about to move to head office in south of France. Classic Brit bikes, fishing and WW11 piston engined aircraft, hope to mahe Reno air races for 60th birthday next year. Hobbies; Kung-Fu, Motorcycles, Music, and Horticulture. 2 daughters 21 and 17 I'm almost free. Unincorporated Illinois where the land is flat and the roads are straight. Turin Saris, 33, scottsdale AZ Ex nightclub manager and bartender, now plant manager and lab tech for a Ensso Emulsions (U.S. sister Co. to http://www.entacemulsions.com/) I also get to Drive a Kenworth T600 and a T800, both w/ 4000 gallon tanks. A T-3 was my first bike 17 years ago. I've had a KTM (POS), a heavily modified Cagiva Allazurra (balled that one) , and currentlly have a Trumpet 1200 Daytona, in addition to my two Guzzi's. I'll be looking for a third Guzzi, probablly a square fin Lemon of some sort. I'm also a muscle car nut, and have involuntarilly collected three cats (the missus knows I'm a sucker). SW Iowa....no we don't grow potatoes here! I decided to never hide behind a nickname...that holds me more accountable for what and how I say things. that's not a put-down of nicknames, just an accountability issue for me. My wife and I own a small town jewelry store. (been in the business itself for 20 years and bought this stoe 11 years ago. Fair enough. And whatever serves to control your impulses ;D I just snap myself with a rubber band. But I digress. Perhaps a one off from the parts bin? For sure it was not type approved or emissions certified for that model year in the USA. Still it wound up titled and registered as a 1984 right here in Michigan. The dealer bidding was a Ducati dealer at one time and is still a Guzzi dealer. Snipper rifle? Does it use scissors for ammo? Alias or not ;D, now that we know who we are amongst ourselves, may I add that if you haven't joined 216 of your Guzzisti friends already on the Google group page to please do so, so we know *where* you are! Thanks for the info. I sold the bike to a pretty well known Dacatisti from Toledo Ohio area. I have heard it now resides with a Detroit area Triumph parts dealer whom I used to deal back and forth with about 25 years ago. It was positively an SS not an S2. Perhaps the title date and GMs involvement had some issues but the ID tag as I recall and title for sure called it a 1984.I still have an old Michigan registration . It had the early style frame, the race kit goodies and the beautiful Contis not those ugly Eastern looking mufflers fitted to the S2.Kick start only and not the S2 style cases. In any event it was a very real 900SS Ducati and titled and probably tagged a 1984. It was only here because GM wanted one. It did come direct from Italy. From your description it is an earlier model bike titled as an '84, which was common, and that would've been even more likely considering that GM bought it for their own reasons (not likely to include rides in the country :-) and so they didn't necessariy need to title it. Married, 5 kids, of whom 4 are still in college. Hobbies... ? I seem to have lost track of them, although I'm enjoying the hell out of a Federico Fellini film retrospective that wraps up this weekend.